I love it when a book takes a back burner idea and brings it to the forefront. Seriously. Every year, the national Librarians Symposium hands out a list of books that are in high demand but low supply. I`m pretty sure that`s where Rick Riordan found his niche in writing. If that`s the case, good on him, because those are the books that are going to be flying off the shelves. That`s what I`m enjoying with author Kevin Gerard. His novels not only carry a Latin American theme, but draws from their history and traditions while blending in ideas from other cultures. Diego`s Dragon uses Mexican tradition and unorthodox views of dragons to weave together a tale that was enjoyable to read, easy to understand, and created vivid imagery. Our hero, Diego Ramirez, wins a dragon statue in a writing contest. It`s handed to him personally by the author who set up the writing contest, Nathan Sullivan. Diego`s family is proud of his son`s success, and his dragon is the talk of the town. What the town isn`t seeing is exactly what Diego sees. The dragon, named Magnifico, moves, talks, and has an attitude that both intrigues Diego and frightens him. According to the dragon, Diego has been chosen as the Guide for his people, to bring back to their home. The dragon is the mentor and serves the Guide, even though it`s often him teaching Diego and helping him see the whole situation when Diego`s eleven year old self wants to see something else. I loved the imagery in this book. It doesn`t take much effort to see Magnifico scaring the spit out of some thugs, or the people rising out of the desert sands. 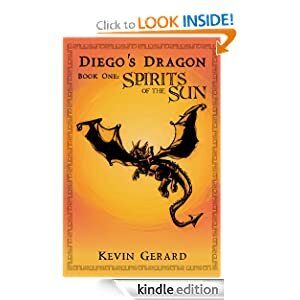 This weekend only, Kevin Gerard is offering free copies of Diego`s Dragon to everyone. Click on the linkhere on October 6th to get a kindle version of Diego`s Dragon for FREE. Then, if you liked that, check here on the 8th of October for book two, Dragons of the Dark Rift.